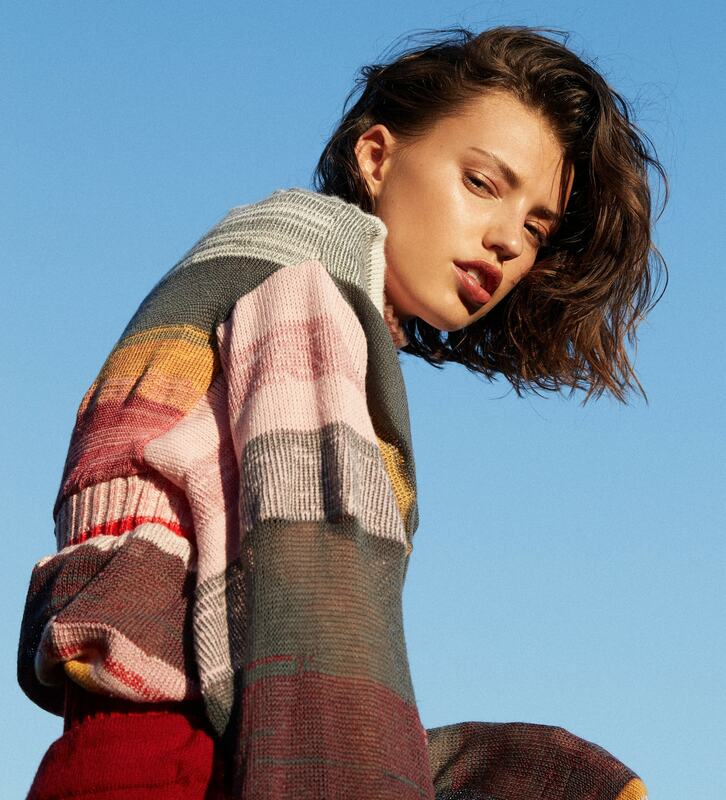 Chloe Mottau is a UTS graduate with a seriously cool eye for colour and texture. Taking inspiration from a unique mix of Indian artisans and Dadaist collage, this talented designer has created an incredible collection that celebrates delicate craftsmanship and playful silhouettes. YOU CREATED SOME INCREDIBLE KNITS FOR YOUR GRADUATE COLLECTION. WHY ARE YOU DRAWN TO THIS TYPE OF CONSTRUCTION & HOW DID YOU REFINE YOUR SKILLS? 100% trial and error! It honestly took me a long time to accept/work with my construction process: that the only way I can create anything is by first creating its textile (and mostly from scratch). I was drawn to knitting because I could sit down and just make. Even if I disregarded 80% of what I was creating, it was therapeutic to put all the ideas, mistakes and experiments into physical form. Then I could run with what I liked, and either correct or disregard what wasn’t working. My collection was initially inspired by the nonsensical nature of dadaist collage, as a creative technique that deals with contradiction, the familiar and unfamiliar, and notions of the uncanny. I explored this through hand woven textiles, translucency vs. opacity, and the use of colour within knit fabrications, generating tensions and harmony between opposing forces. I’m also inspired and driven by this sense of naivety and playfulness, an openness and curiosity to see where my own intuition and unconsciousness can lead to. My aim is to materialise that somewhat uncomfortable, electric sensation when experiencing the surreal. Once I’d finished my collection, which I’d tried so hard to keep as natural as possible (at least 90% woollen/natural fibres), I was struck that it might not read this way. So I wanted to make sure that my campaign images maintained this colourful playfulness with an organic overtone. My phenomenal photographer, Kristina Yenko, had a really cool vision for the whole thing, marrying the linear nature of my work with the natural formations of our surroundings. WHO ARE YOU DESIGNING FOR – WHO’S YOUR TARGET MARKET? Textile orientated, eco-conscious and nostalgic, yet radical dreamers. In an absolute crazy dream world, I’d love to work for Alexander McQueen – I’m drooling just thinking about their textiles, and what it would be like to be part of that insanely creative process. I’m definitely still figuring that one out! I’ve being lucky enough to work as a design assistant for an amazing designer (and personal mentor) since January, and I definitely plan to continue creating in 2019. I’m not quite sure what that will look like yet, but I think it’ll involve a bit of travel, meeting with and learning from talented artisans (and probably a lot of knitting). WHAT IS THE FIRST PIECE OF FASHION YOU EVER LOVED OR MADE? My parents often remind me that I demanded to dress myself from about three years old (which is probably less to do with fashion and more to do with a stubborn temperament) but I can still remember my absolute favourite dress from around that time: a long, sleeveless denim dress (which I’d rock with a skivvy in winter). I’ll never forget the day I grew out of that masterpiece. A really pivotal point in developing my adoration of textiles was a trip to India in 2016. The artisans there were ridiculously talented, as well as phenomenal teachers. I just love that there’s such a rich and diverse history in cultural textile practices, a sort of storytelling. So, I guess all of them have been my inspiration, and hopefully as I travel and meet more beautiful craftspeople, I can add them to this list too. I absolutely love @shusaku1977, they create these confronting/funny/nostalgic/culturally relevant collages that are just super cool. And sticking with the collage theme, @ampmdesigns features the work of a fashion collage extraordinaire that I live for. Congratulations Chloe – we can’t wait to see you knit your way into the heart’s of fashion lovers everywhere. 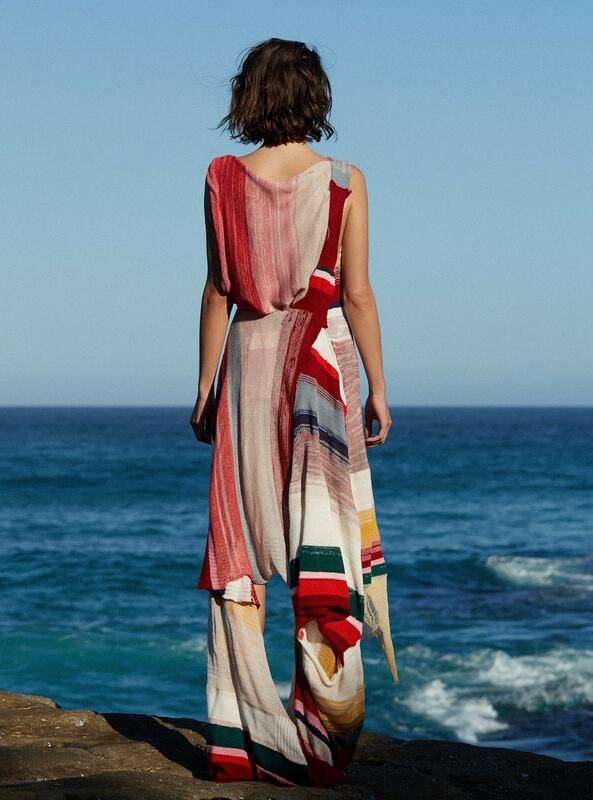 Click here to view all UTS graduates in this year’s Emerging Designer Showcase.